Saab 9-3 4-cylinder Diesel 1998 to 2002 with Chassis number up to and including 12020000. 2 per car. Saab 9-3 Sports 4-cylinder 2.2 Diesel 2003 to 2004 with Chassis number up to and including 41019992. 2 per car. Saab 9-3 Sports 4-cylinder 2.2 Diesel with chassis number from 41019993 onwards. 1 per car. Saab 9-5 4-cylinder 2.2 Diesel 2002 models only. 1 per car. The chassis number refers to the last 8 digits of the cars VIN number. This valve is part of the EGR system and works with the EGR valve to divert exhaust gas back into the air inlet in order to reduce harmful emissions of oxides of nitrogen. OEM quality part. 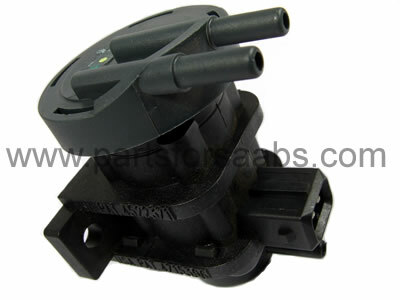 Equivalent Saab part number - 4782058, 9128022 (reference only).